The economic depression of the early 1870s was particularly severe in the South: yeomen farmers were engulfed by poverty and planters by indebtedness. Just as African Americans were increasing their political influence, the depression limited their power to influence working conditions: independent black farming became difficult so that most owners and renters were reduced to sharecroppers and wage laborers. Resentment and resistance among white southerners would increasingly undermine the law of the land through organized acts of violence and state legislation. Donald J. Currier noted that "In September 1874, a simmering political controversy boiled over. Since the end of Reconstruction, Louisiana had held a series of elections that resulted in competing claims to power by two governors, two lieutenant governors, and two legislatures. ... The recognized governor, William Kellogg, asked President Grant to send federal troops to put down the rebellion.... the Democratic minority staged a forcible coup d'état in the statehouse, drawing knives and pistols and physically beating the Republicans into submission.... The Governor called for assistance, and federal troops again restored order.... A similar situation occurred in Arkansas in 1874. Two different groups claimed the right to the statehouse. Both requested the assistance of the Federal Government..."
Supreme Court decisions hastened the end of Reconstruction. Under the Enforcement Act of 1870, indictments had been made against several southerners who were charged with preventing blacks from voting. But in 1875, the Court's decisions favored the defendants and interpreted the Fifteenth Amendment in an ambiguous fashion. Two decisions in 1876 by the Supreme Court narrowed the scope of enforcement under the Enforcement Act and the Force Act. Democratic candidate Samuel J. Tilden won the popular vote for president on 07 November 1876 by a 250,000-vote margin. 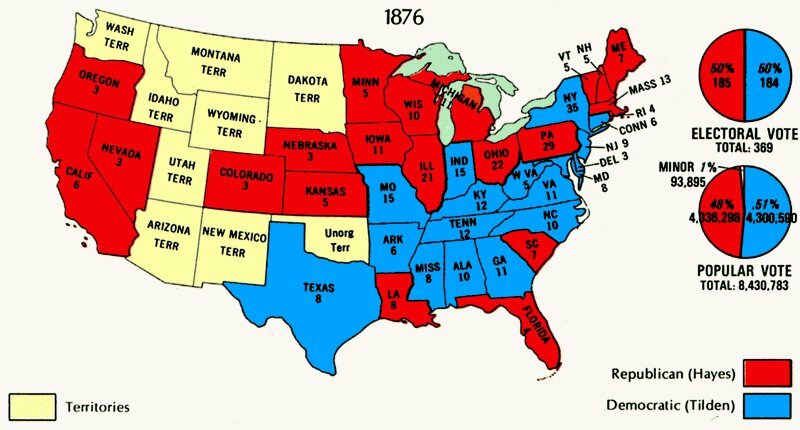 Preliminary Electoral College tallies predicted that Tilden would defeat Rutherford B. Hayes, his Republican opponent. However, the ballots of four states -- Florida, Louisiana, South Carolina, and Oregon -- were called into question. A total of 20 electoral votes were in dispute. Of these votes, Tilden needed only one to become president; Hayes would have to successfully claim all 20 of them to defeat his opponent. With the country still reeling from the Civil War and the election cutting to the heart of continuing sectional conflict, a peaceful resolution was crucial. Southern Democrats in Congress were dealing with Hayes' lieutenants, suggesting a basis of compromise. If Hayes would withdraw federal troops where they remained in the south -- South Carolina and Louisiana -- they would support the selection of Hayes as President. Congress declared Hayes the victor on 02 March 1877, just two days before his term began. In return for Louisiana's presidential electoral votes, Republican Rutherford B. Hayes recognized Democrat R. T. Nicholls over Republican Stephen B. Packard as Governor of Louisiana. Nicholls had to determine which of the rival legislatures would act as the official institution. Nicholls convinced some Republicans to join his Democratic faction to give it the necessary quorum. After the last federal troops were pulled out of Louisiana on 24 April 1877, several southern states inactivated their black National Guard units. As president, Hayes promptly fulfilled the promise he had secretly made to Democrats during the electoral dispute: that he would withdraw Federal troops from those states that they still occupied in the former Confederacy, thus formally ending the Reconstruction era. This action eased acceptance of Hayes' presidency among Southern Democrats and strengthened the rising spirit of postwar reconciliation among white Americans. It did so, however, at a severe cost to Southern African Americans. The end of Reconstruction was marked by the removal of federal troops after the Hayes-Tilden Compromise of 1877. Radical Republicanism gave way to conservative policies favoring southern Democrats and "home rule" was restored to southern states. This resulted in a climate in which violence could be used to depress black voter turnout and fraud could be used to undo the effect of lawfully cast votes. Once whites regained control of the state legislatures using these tactics, a process known as "Redemption," they used gerrymandering of election districts to further reduce black voting strength and minimize the number of black elected officials. The 1878 Posse Comitatus Act prohibited the direct use of federal military troops in domestic civilian law enforcement, except where authorized by the Constitution or Acts of Congress. The phrase "posse comitatus" translates from Latin as the "power of the county" and was used at common law to refer to local citizens over the age of 15 upon whom a sheriff could call for assistance in preventing any type of civil disorder.